Montessori materials can be a bit mystifying for anyone who has not seen them at work. On the surface they may appear simplistic, yet there is a great deal of thought behind these unique classroom tools. 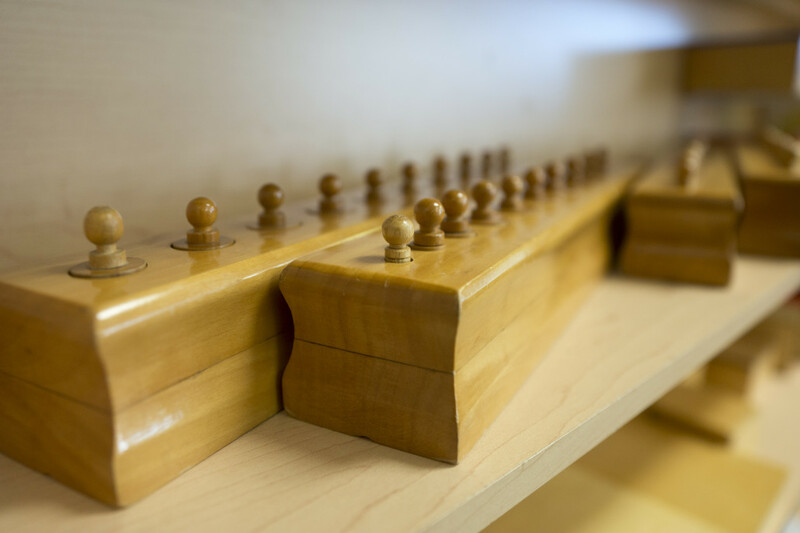 The knobbed cylinders are part of the original set of Montessori materials. 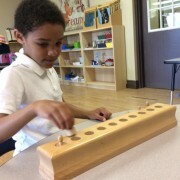 With an excellent hands-on introduction to size, the knobbed cylinders give young Montessori students indirect preparation for mathematics while learning about dimensions and developing fine motor skills. This set of four blocks, each with a series of cylinder insets which vary in size, help to develop the child’s visual discrimination of size as cylinder sets vary in height and/or diameter. In addition, the knobbed cylinders indirectly prepare children for writing, through the physical handling of the cylinders by their knobs. These fingers are also used in the manipulation of many simple tools such as a spoon, scissors etc. The hand is being trained for manipulation skills in a methodical way. A graduated sequence of exercises are offered through the material, as students learn to judge size by height, and in time, reach an understanding of the more abstract concept of dimension. Once proficient in one knobbed cylinder set, the child can take out multiple cylinder sets at a time to add further challenge with more variety of height and diameter. 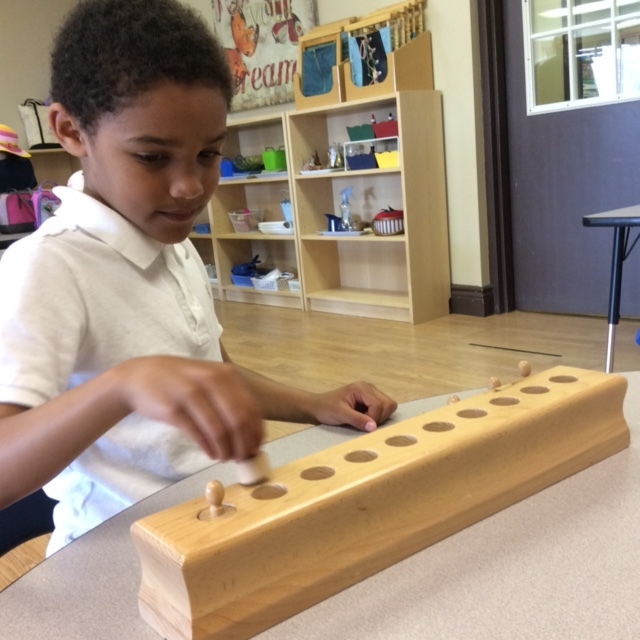 Not only do students learn about size and dimension through the knobbed cylinders, but they gain vocabulary related to these topics, practice left to right progression and learn beginning problem solving skills. This knowledge enables them to observe and interact with their environment with greater awareness and insight. Like all Montessori materials, the knobbed cylinders are self-correcting. When a piece does not fit, or is left over, the student will know he or she is not yet finished. Children are able to determine that a problem exists and take steps to address the problem without any intervention from a teacher. This produces a deep sense of accomplishment! The knobbed cylinders are just one of many sensorial materials which support abstract concepts. Is there a Montessori material you would like to know more about? Leave us a comment and we’ll feature it in an upcoming blog. If you would like to learn more about Montessori materials, please give us a call or drop in to our Whitby campus for a tour. Kendalwood Montessori & Elementary School is Durham Region’s first fully accredited Montessori school. At Kendalwood, we believe that our job is to inspire children to become the best students they can be. With a curriculum that focuses on developing the intellect as well as nurturing self-esteem, academics are taught, curiosity is cultivated and respect is fostered. Our approach creates an environment where students flourish and develop a lifelong love of learning.